Honda has a sensible approach to internationalizing its Accord. All Accord models worldwide share a midsize global platform and key mechanical elements. But overall size, styling detail, and ride and handling settings are very much down to the needs of specific geographical markets. So the Accord for the Japanese market is narrower than that for Europe, which in turn is smaller than the Accord for the U.S. The latest European Accord has just been released, and Honda's research and development centers in Offenbach, Germany, and Swindon, UK, have successfully created a Japanese car that has clear European overtones with styling, trim, and other details specific to Europe. Honda is offering the Accord with a choice of three engines: 1.8-L with 100 kW, 2.0-L with 108 kW, and a high-performance, twin overhead camshaft 2.2-L with 156 kW for the Accord Type-R. The smaller engined models can be specified with a five-speed manual gearbox or four-speed sequential shift plus auto. The car is being marketed initially as a four-door sedan, with a five-door hatchback being added later. 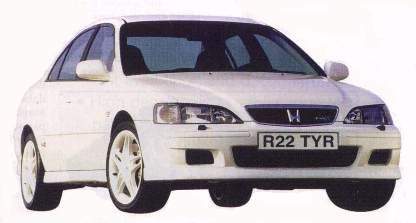 The European Accord is built only at Honda's Swindon, UK, plant. Although compared to the previous Accord the new model is shorter, with a reduced wheelbase, cabin space, notably for rear seat passengers, is enhanced, partly because of the use of a new five-link, double-wishbone rear suspension. Honda has given the new car an improved anti-theft system, including a rolling-code immobilizer and shielded lock mechanisms. Front and side airbags are fitted. The Type-R Accord has a close-ratio five-speed gearbox, wider wheels, ventilated front brake disks, increased torsional rigidity, uprated springs and dampers, a helical limited-slip differential and gas-discharge headlights. Much of the regular Accord's noise insulating material is removed. Some 90% of each Accord is sourced inside the European Union.